Water under bottom of washer. I recently sold my Whirlpool and got a Kenmore front load washer. I just found a puddle of water under my washing machine. I am not sure if someone spilled water or if the washer is leaking. 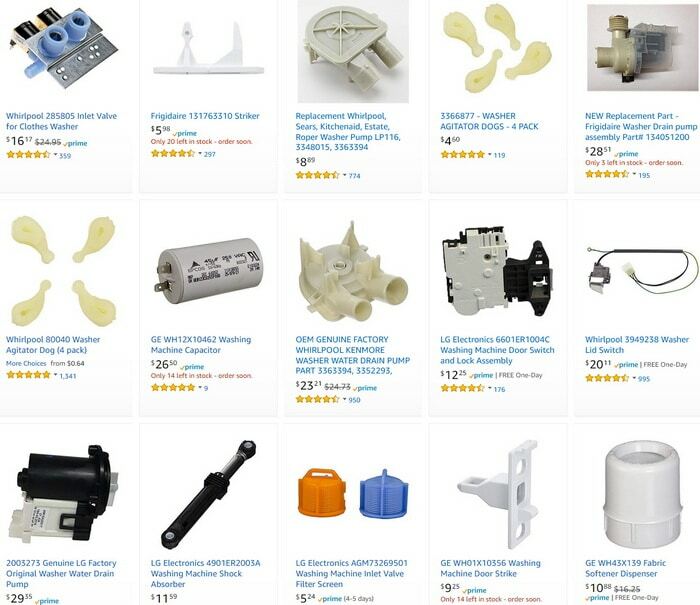 If it is leaking, I do not know if it is leaking during the fill cycle, during spin cycle, from the drain hose, or when the washer is not in use. I do not want to call an appliance repair company to fix my washer until I know for sure. I live in a condo on the second floor so I don’t want water leaking into my neighbor’s condo and I don’t want to be using a washer that is leaking every time I do a wash. Is there something I can easily check to be sure the washing machine is not leaking underneath? 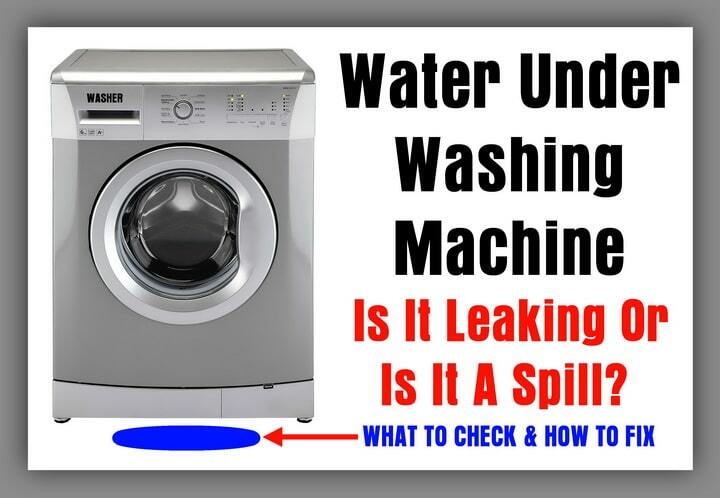 Water Puddle Under Washing Machine – Is It Leaking Or Is It A Spill? NOTE: When working on any appliance, REMOVE POWER before troubleshooting. 2 – Run a complete wash cycle as you normally do with clothing in it. Once the washer has completed the wash, check under the washer for any water under or around the washer. 5 – Check the 2 water supply hoses that connect from the wall to your washing machine. First be sure they are not cracked or ripped. Make sure they are very tight. Run a test wash. If the water supply hoses are still leaking after tightening, you may need to replace the o-rings that go on the output and input sides of the washer water hoses – 4 in total. Replace all 4 and run a test wash again. NOTE: When water leaks during the fill cycle, it usually means the water supply hoses are loose. 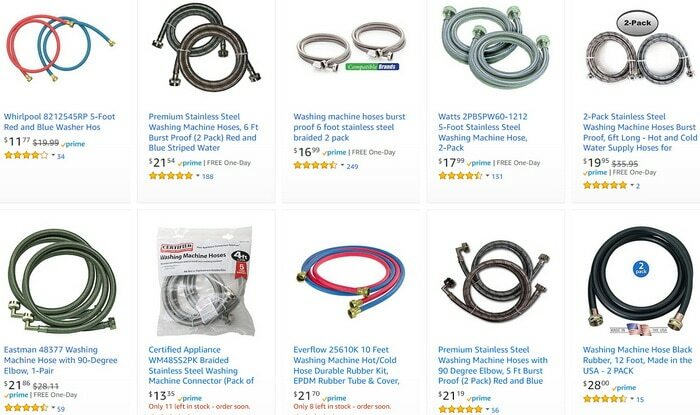 6 – Water supply hoses to your washer usually have a mesh screen filter where the water hose connects to the washer. If these are very dirty and blocked, these also can cause a water leakage. Check the water hose mesh screen filters to be sure they are not clogged and causing a leak by not letting the water fully enter the washer. 7 – Be sure your washer is completely level by adjusting the washers feet. Use a level and place it on top of your washer to be sure. If the washer is not level, it can leak out water as washers are designed to be used on a fully flat surface. The washer legs are there so if your floor is not level you can level the washer easily. 8 – Be sure your washer is NOT overloaded with too much clothing or blankets. If overloaded the water may leak out. Always use the proper amount of clothing when washing and try to no overload. 9 – When washing, be sure you are not adding excess HE detergent or adding the wrong detergent as this can cause excess suds and cause the washer to leak. Be sure you are using the correct HE washer detergent.. check your manufacturer’s manual to be sure you are using the amount it recommends. 10 – Check and be sure the drain hose is 100% secure to the drainpipe or stand pipe. If loose it may leak and leave water on the floor or under the washing machine. Also be sure the drain where the washing machine water flows out is not blocked or clogged. 11 – Be sure the washer drain plug is removed. If your washer is new then it comes with a drain plug that will need to be taken out before you connect a drain hose. NOTE: If you run a wash cycle and the plug is not removed, the washing machine will not drain correctly and water will end up on the floor. 12 – If all hoses and hose parts are tight and in good condition, then the next thing to check is… internal hoses for draining or filling may be loose or faulty. Check inside to be sure all is secure and no leaks are present. 13 – If washer leaks when not in use, simply check the water hoses at the back of washer as they are most likely loose or are brittle and need replaced. Need help with water leaking from washing machine? Please leave a question below and we will assist you in fixing the problem. My lg front washer leaks when I do a tub clean any reason this happens? I have an older Bosch Nexxt front loading washing machine that is throwing me an error code 85. What does that mean? LG WM4270HVA washing machine leak large amount of water doing drain. Does not matter what cycle I have machine on? any ideal what it could be? My new Samsung front load washer leaks water from underneath only when I wash blankets doesn’t matter what cycle or always leaks but only on blankets and I’m not overfilling the washer. hey mine is doing the same thing and Samsung and Home Depot refuse to replace the unit even tho we just got it a few months ago… did you have this issue fixed? Im at my whits end!!! Hi my washing machine is leaking from inside the washing machine where the clothes go in. Is this a major problem how do a fix the problem? Can I still wash my clothes in the meantime or better to fix it first? I noticed a large puddle coming from under my washing machine after I did a load. When I took the front panel off there was a fair amount of water sitting all along the bottom of the front half of the washer. It is a GE washing machine and is 15 yrs old. Time to get a new washer? (The transmission was replaced at 10 yrs – still under the 10 yr warranty – and we replaced the motor several years ago). I have a top loading Maytag that has begun to leak water from underneath. But the water does not appear until a day or two later. What could be the cause? Our washing machine has been leaking water for awhile now, it leaks during the wash and rinse cycle, probably about a pint to a quart every wash cycle, checked the hoses and they are all tight, we have no idea where the water is leaking from. Any suggestions ? GE; Model # GTWN2805DOWN; serial # FZ1865526. We have water leaking overnight after a load has completed. Not leaking during the machines operation or at least it takes a good bit of time for the water to show up. We have checked supply hoses and drain line and all appear dry. Next post: LG Refrigerator Error Code Er FF – How To Clear?